As part of our ongoing relationship with Brooklands Museum we were recently asked to come up with an image that would sell their new 4D movie attraction: The Napier-Railton Race Experience. The Napier-Railton itself is a car that has gone down in automotive history with any number of world records and firsts to its name. Still in operation, the team at Metropolis Entertainment took it and two other historical cars over to the track at Montlhéry just outside Paris to film a 3D spectacle as the viewer rides along with the mighty Napier-Railton in a race around the banked circuit. The film was then combined with motion controlled seating in the auditorium at Brooklands Museum to give a realistic racing sensation. Our job was to condense this experience into a single image, capturing the speed and feeling of the race in a manner that would appeal to both young thrill seekers and avid automobile enthusiasts alike. With Brooklands Museum giving us free reign, we arrived at the ‘First Person View’ idea, putting the viewer right in the driver’s seat as the track races by. 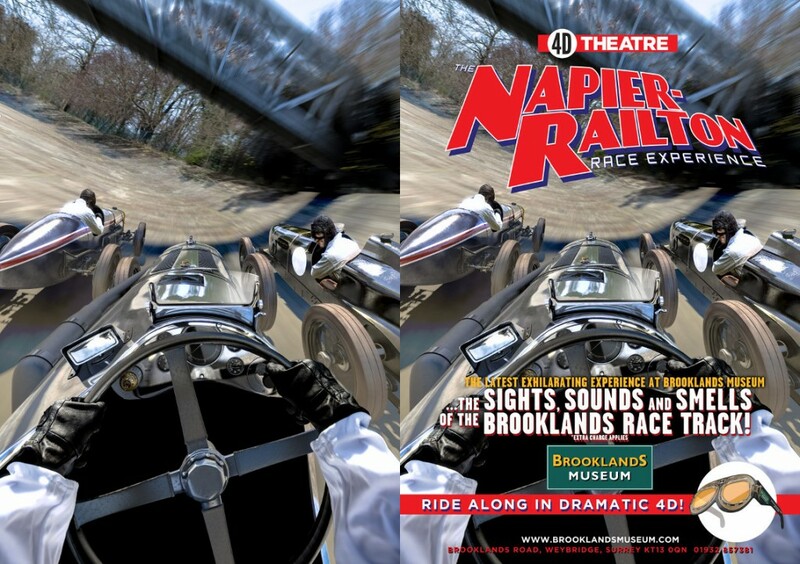 As part of the brief we were also asked to come up with a logo for both the 4D Theatre and The Napier-Railton Race Experience which were influenced by automobile imagery and period fonts. To realise this, we created accurate, detailed digital models of the Napier-Railton itself, the Delage DH V12 (left), the Pacey-Hassan Special (right) and the Member’s Bridge area of the Brooklands Circuit. All Modelling was achieved in Maya and we took the opportunity to try out the node based texturing software Substance Designer. It worked particularly well for the car models as a procedural layer of dust could be recycled across the different models. Drivers were photographed and final compositing was completed in Nuke. The attraction is open now on site at Brooklands Museum.